Members of the St. Jacob Lutheran Church from Anna, Ohio journeyed to Italy and Germany on a thirteen day tour to build and strengthen their faith and fellowship. 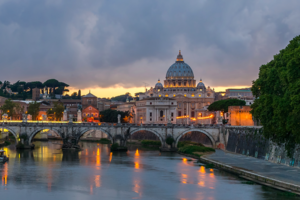 The journey began in Rome, visiting “bucket list” sites associated with the early Christian Church, the Roman Empire and the Renaissance, including the Vatican Museum, the Coliseum and Roman Forum, and Michelangelo’s “David” in Florence. The journey ended in eastern Germany to visit iconic sites associated with the Reformation movement and Martin Luther, including Wittenberg and Erfurt. “What a great trip! And Faith Journeys did a fantastic job meeting my expectations and working with me on the itinerary. For the most part, the Vatican, Florence, Augsburg, Leipzig, Erfurt, and Wittenberg were the high points for me and the group as a whole. Our specific tour guides were outstanding and they made the history of the places come alive. It was evident that they were really into their individual subject matters. All of our tour agreed that they added to the spiritual aspect of our tour. I also had ample time to add spiritual dimensions to our tour which was very nice. « St. Matthew’s Church Returns from Ireland and Scotland!